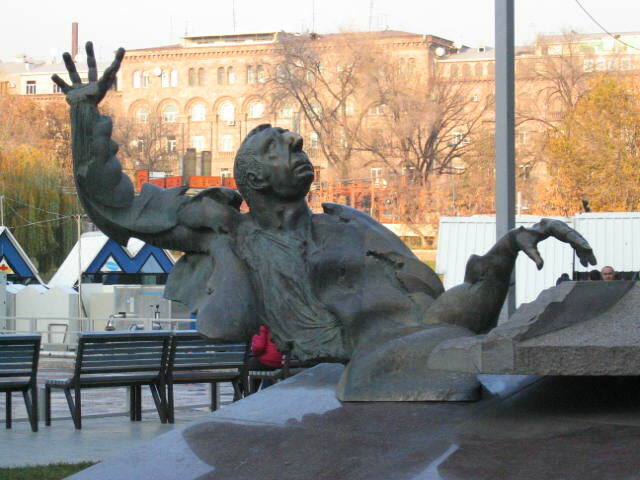 Yerevan's monument to the well-known Armenian composer Arno Babajanyan was originally placed at it's location on the corner of Tumanian and Terian Streets in September, 2002. Before it could be unveiled, a controversy erupted over its appearance and things were postponed while it was modified. It was then officially unveiled July 4, 2003 by Yerevan mayor Yervand Zakharyan with the musician's famous «Nocturne» playing as background music. The author is sculptor David Bejanyan. Babajanyan is pictured playing the piano. The statue first appeared in Opera Square last September and before it could be officially presented it had created so much uproar that even President Robert Kocharian weighed in on the debate. Public outcry was so great that the statue was dismantled and its creator, sculptor David Bejanyan was asked to make modifications. Other artists defended Bejanyan's work, while intelligentsia, fans of the popular musician and traditionalists called it a disgrace. At the heart of the dispute was the manner in which Bejanyan chose to portray Babajanyan, giving the musician a rather whimsical and exaggerated expression, and exceptionally long fingers that critics said made him look like a bird. Bejanyan reluctantly agreed to alter the statue, saying that he would not compromise the general mood of the piece, but would tone down its caricature appearance. After seven months the statue returned to its pedestal, where Babajanyan is represented, seated at a grand piano (made of Ukranian basalt). The bronze sculpture cost about $50,000, given by benefactor Ruben Hayrapetyan who said Bejanyan and an architect donated their work. The artist made subtle changes, but not obvious enough to satisfy critics. The revised Babajanyan has shorter fingers and his face is more realistic. But in a city filled with serious-faced, static statues of heroes, this one will no doubt continue to divide opinions of onlookers.